My first concert of my life was New Kids on the Block at the Baltimore Arena in 1990 – I was almost 18. (I wasn’t allowed to go to concerts until I graduated high school.) Twenty-three years later I still love the NKOTB! The only difference is back then I was a ‘Danny girl’ and now I’m a ‘Jordan girl’. 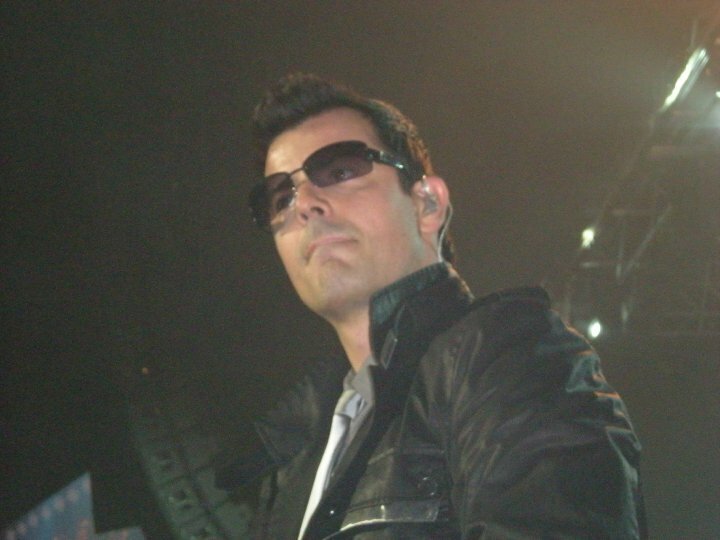 I get criticized for being a BlockHead – that’s what the NKOTB fans are called. My U2 friends can’t believe such a passionate U2 fan like myself is also a passionate NKOTB fan, but I don’t care because I love the 5 guys from Boston. They are so entertaining and great to to their fans, their concerts are a blast – and they’re hot! Sadly I don’t have any of my old NKOTB memorabilia. I have no idea where my tour program, concert ticket, Step By Step vhs tape, or Danny pillowcase is. I never get rid of anything, but who knew NKOTB would make such a great comeback after all of these years. 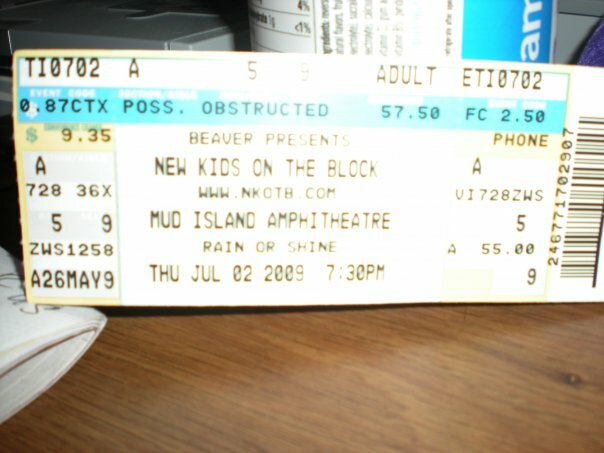 19 years later, I saw NKOTB again in Memphis on July 2, 2009. It was in support of their new record The Block. I was in the 5th row. I had the best time at that concert! So much fun to relive my youth. All the screaming girls who were in their teens in late-80s, early-90s were now screaming women in their 30s. They had just gotten back together the previous year. I arrived early to the venue and saw Jorday and Joey and his family arrive by golf carts to their tour buses. Then during the opening act, Joey’s wife and son were sitting across from me and I danced with the little boy – so cute. Earlier that day, Joey had been at Graceland – of course I was working at the National Civil Rights Museum and was unable to stalk them. But Joey wore his Elvis tee shirt while he sang Jailhouse Rock, so that was pretty cool. To see all my pictures from that show, please click here. 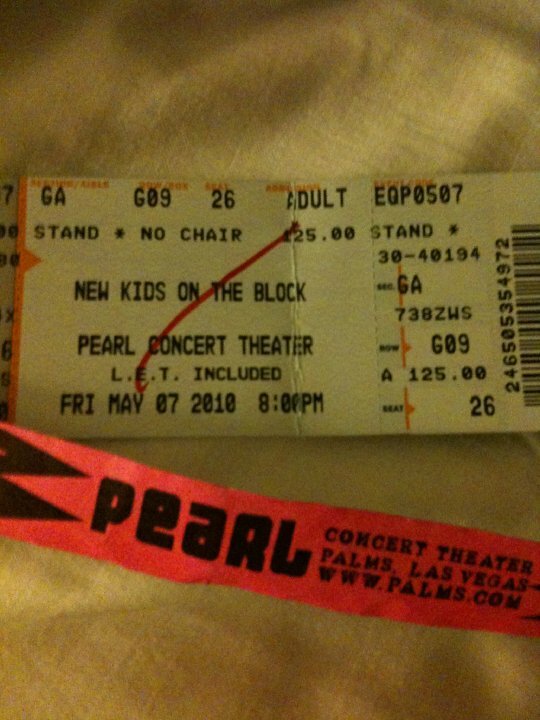 I saw NKOTB the following year on May 7 & 8, 2010 in Las Vegas for the opening of their Casino Tour. 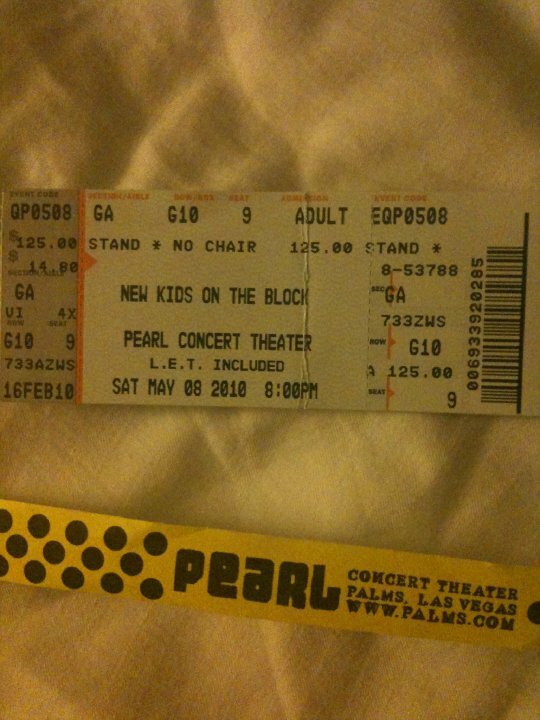 These two opening shows of the tour were general admission at the Pearl Theatre at the Palms Hotel. For opening night, I was up front on the rail, but all the way to the right – but luckily I got some close Jordan action there (even touched him). 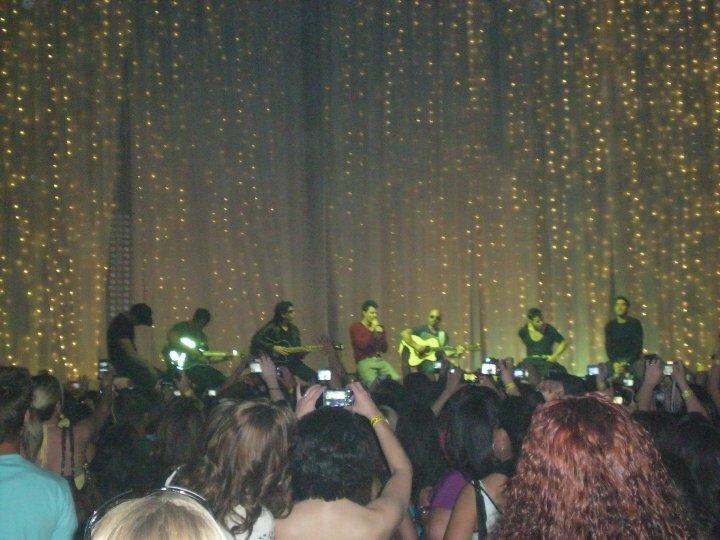 I loved the acoustic set NKOTB did – especially Single, which was quickly becoming a favorite of mine. 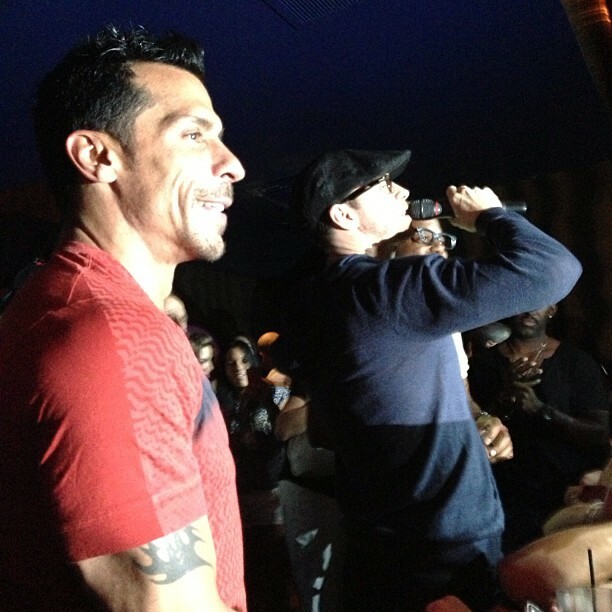 After the opening night show, NKOTB invited everyone to their after party at Rain – free admission with our concert ticket. This is a place I would never ever go to, but since Jordan was going to be there so was I. The concert was over at 9:15, and Rain didn’t open until 10:30. Finally at midnight Jordan, Danny, Joey, Donnie and Jon arrived – and went to opposite end of the room from where I was. From their restricted balcony, I got to see Jordan dance, Danny flirt, Donnie work the crowd and Joey make out with his wife. I have no idea where Jon went. The second night of NKOTB in Vegas I didn’t line up early, but still had a great view. I stood dead center toward the back of the floor at the sound board. This was a great spot too because when the guys came back to sing Tonight they were right in front of me and then I got to shake each of their hands as the ran by to back to the main stage. Poor Jon fell off the stage during Tonight. Even though I was closer for opening night, I enjoyed this second Vegas show better. Musically the show was the same as the first night, but their energy was much much better the second night. The guys were having so much more fun. Donnie messed up the lyrics and laughed about it. Then Jordan messed up his dance and laughed about it. They made Jon sing Step 5 of Step By Step. They joked about all the fans complained about the show only being an hour and fifteen minutes last night – tonight it was almost an hour and a half. To see all of 161 of my pictures from both NKOTB shows in Vegas in 2010, please click here. 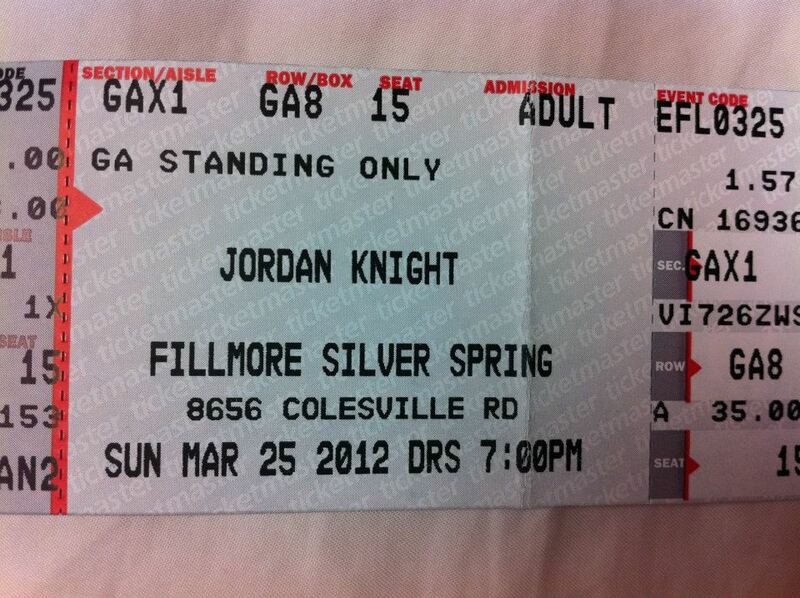 Two years later I saw Jordan Knight solo on March 25, 2012 at The Fillmore in Silver Spring, Maryland. It was a great show! Jordan is very entertaining, funny and of course hot! I wore my Jordan boyfriend tee shirt and listened to Single repeatedly on my half hour drive to The Fillmore. I arrived just after the doors opened at 7pm. I got a spot on the front rail all the way on the end, but it was a great view. 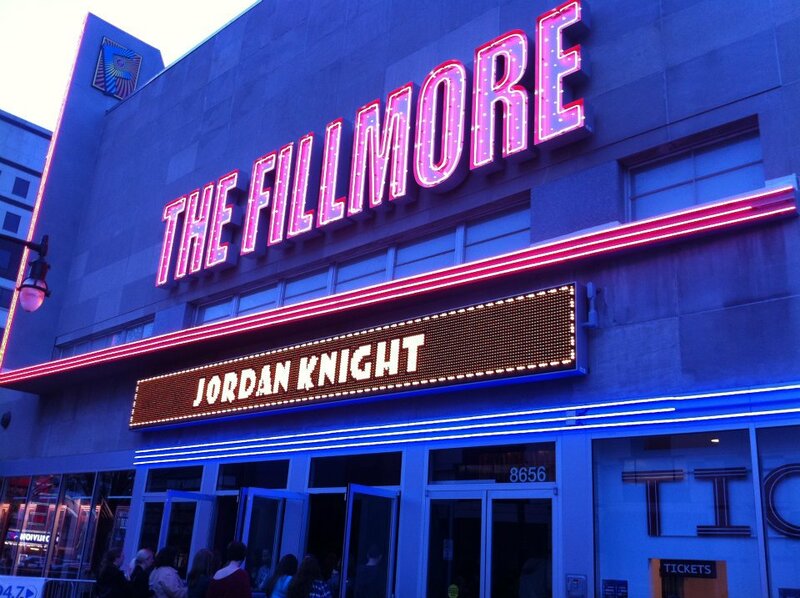 My ticket said doors opened at 7pm and the Fillmore website said the show started at 8pm, but Jordan Knight didn’t take the stage until 9:05pm – and only played until 10:23pm. So basically I waited for Jordan longer than I saw him perform. 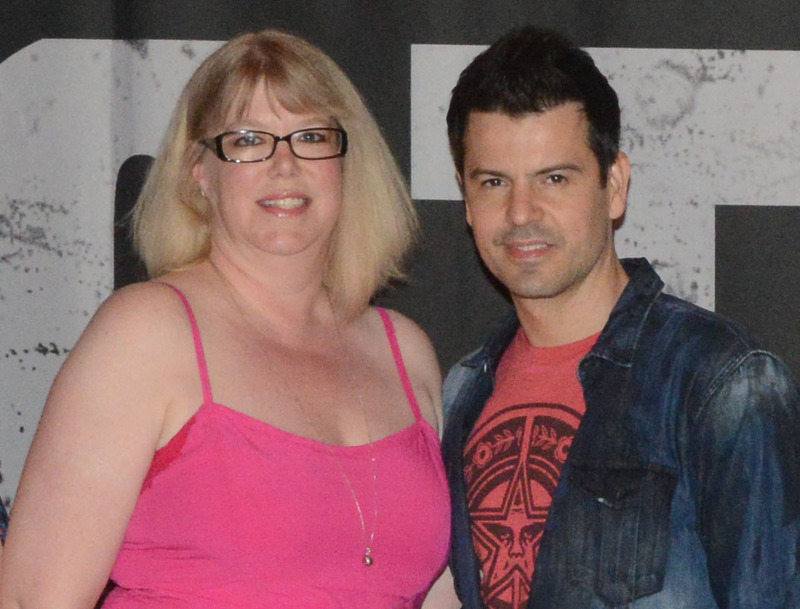 But it was well worth the wait because Jordan Knight put on a great show, very intimate and entertaining! 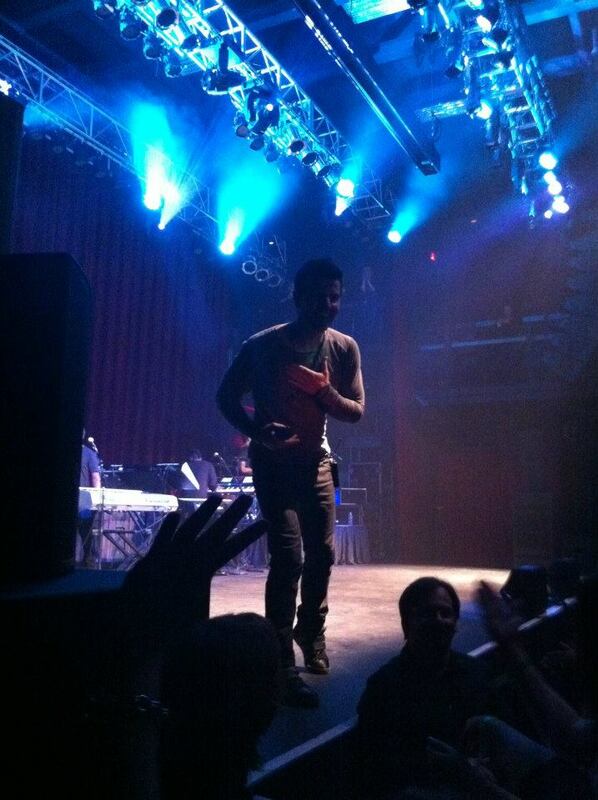 He talked and interacted a lot with the audience, including bringing three fans on stage to dance during Rockstar. The highlight of the show for me was Jordan’s performance of NKOTB’s The Right Stuff. To see all my pictures from this show, please click here. 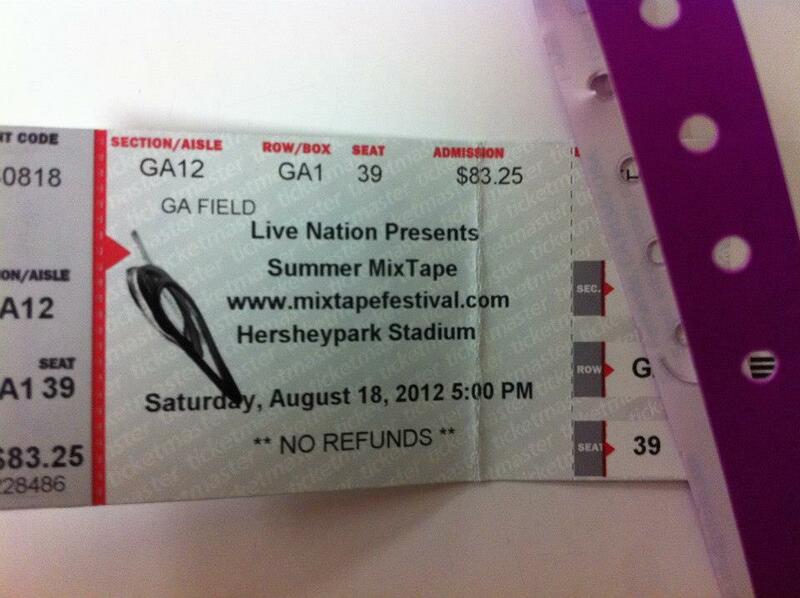 Five months later, I saw NKOTB at the MixTape Festival in Hershey, Pennsylvania on August 17th and 18th, 2012. The first night it was just NKOTB and the second night it was NKOTBSB. The first night was better – absolutely amazing! Although I am glad I did get to see NKOTBSB because I missed their tour in 2011 because I driving around the US for three months on the U2 360 Tour. My friend Abbey and I got in the GA line on Friday and by 3:45 we were inside the stadium one person back from the rail behind the VIP section. We noticed there were five platforms (let’s call them blocks) spaced along the rail on the VIP side. We quickly realized 5 blocks for 5 New Kids. We knew that NKOTB performs one song in the middle of the audience. I mentioned to Abbey that it would be great if they opened the show out here in front of us, rather than on the main stage. We stood behind the center block. Even though we were one person back, we were so close that we could reach out and touch it. Luckily for me, I am tall and the person in front of me was not. Minutes after we had secured our spot at the center block, it started to rain and then downpour – and it continued to drizzle the rest of the night. After listening to Aaron Carter, Steel Panthers and Paully D, the opening montage for NKOTB finally began at 8:45pm. After the retrospective video, I saw NKOTB riding through the stadium on a what looked like a golf cart. I was right, they were starting the show on those five blocks – right in front of us! It was so exciting watching them run in. Unfortunately Jordan ran past us to the block on the right. Donnie got on the block right in front of us. They opened with One Song. Towards the end of the song, all five of the New Kids were directly in front of us on the center block. 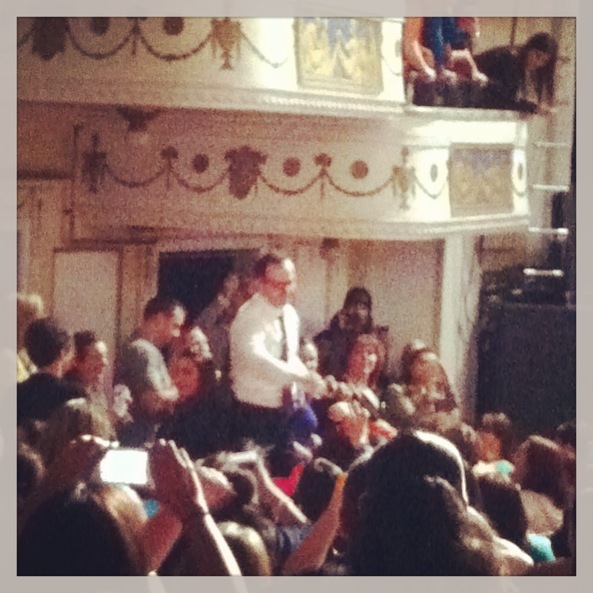 Unfortunately Jordan and Joey were facing the other way toward the VIP, but Jon, Donnie and Danny were facing us. They were all wearing Adidas track suits. 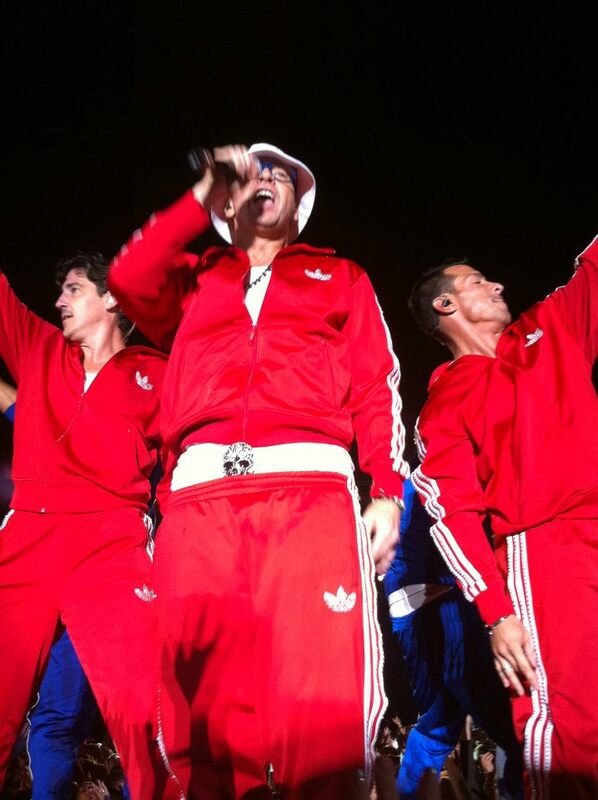 Jordan’s and Joey’s were blue with matching blue sun glasses while Jon’s, Donnie’s and Danny’s were red. At the end of the first song, they all started to get off of the block – except for Jordan! At that moment, I felt a big push like I was riding a wave and I ended up in front of Abbey (who had been standing next to me) and completely squishing the girl in front of me who was luckily really short. I was even closer to Jordan now! 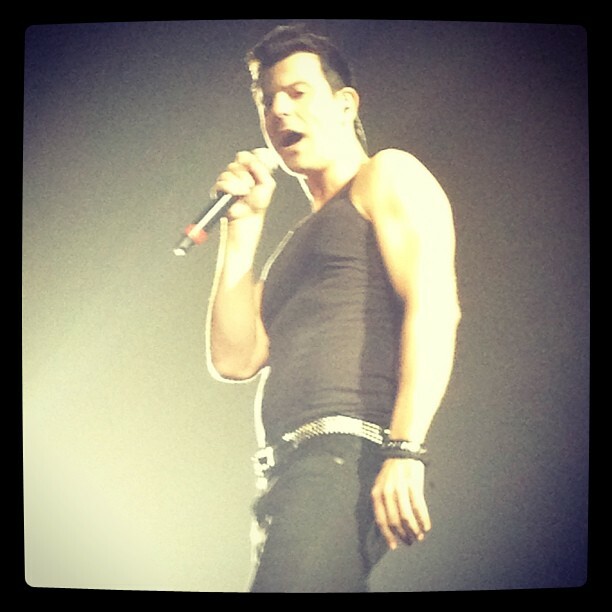 Then Jordan (and the rest of NKOTB) took off his track suit and was wearing a white tank and white pants. My legs were quivering – I was so excited! Abbey said Jordan was posing for me. NKOTB performed Summertime while Jordan was in front of me – not that I remember. All I remember is my neck hurting from looking straight up at Jordan because he was so close, reaching out for him to touch me (which he didn’t) and my legs shaking. It was quite an amazing three minutes! At the end of Summertime, Jordan left and Joey came to our block while NKOTB performed Dirty Dancing. I let Abbey get in front of me, so she could see – besides Jordan had already left for another block. After Dirty Dancing, NKOTB went to the main stage to perform to the anxious VIPers who I’m sure were none too happy that the lowly GAers got a close up performance for the first three songs. Friday was Donnie’s birthday, so Jordan, Joey, Danny, Jon, and the audience sang Happy Birthday. And then out of nowhere Jon started singing NKOTB’s version of Happy Birthday! It was great because Jon never sings and is very shy on stage. He stopped after the first verse and Donnie told him to keep singing “it’s the same lyrics.” And even Jordan tried to help him, hiding behind him singing. Then a girl from the audience gave Donnie a birthday present, some sort of giant chocolate bar from Hershey’s Chocolate World. A while later, I think it was Jordan who said something like let’s go back out there to perform this “they’re VIP too!” So back they came – right in front of us. Unfortunately, Jordan did not come back to our center block, but he was on the one to the left of us. Joey was in front of us while they performed Tonight. But it turned out to be great because Joey’s wife brought their little son Griffin up on the block with Joey. And together they sang. It couldn’t have been any cuter! 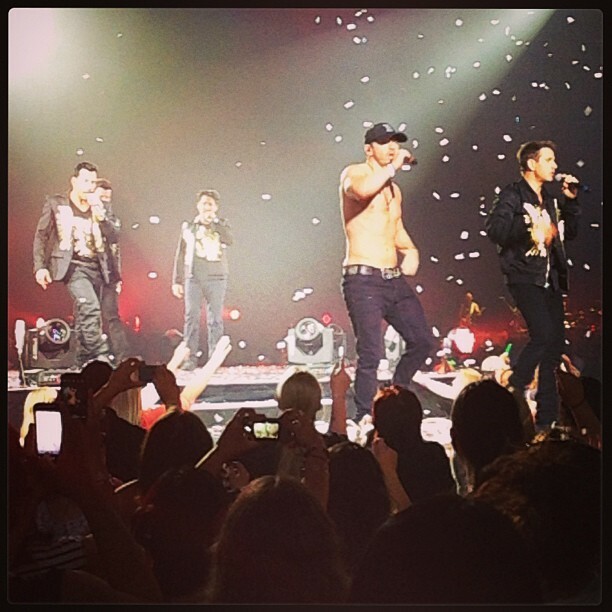 Then NKOTB returned to the main stage for the rest of the show. At the end of the show, 98 Degrees joined NKOTB on stage during Hangin Tough. I got to see Nick Lachey and Jordan Knight standing next to each other. Sigh! As they were saying goodnight, Donnie told everyone to go watch Kelly Clarkson’s performance because they had a surprise for us. So at 10pm we went to the other end of the stadium to watch Kelly Clarkson, who was very good. About a half hour into her set, Joe McIntyre walks out and they sing an amazing duet together. We left after that and caught the shuttle back to the hotel. We were back by 11pm, but I didn’t fall sleep until after 3am. I was just too excited and kept replaying the show in my head, especially those first three songs. 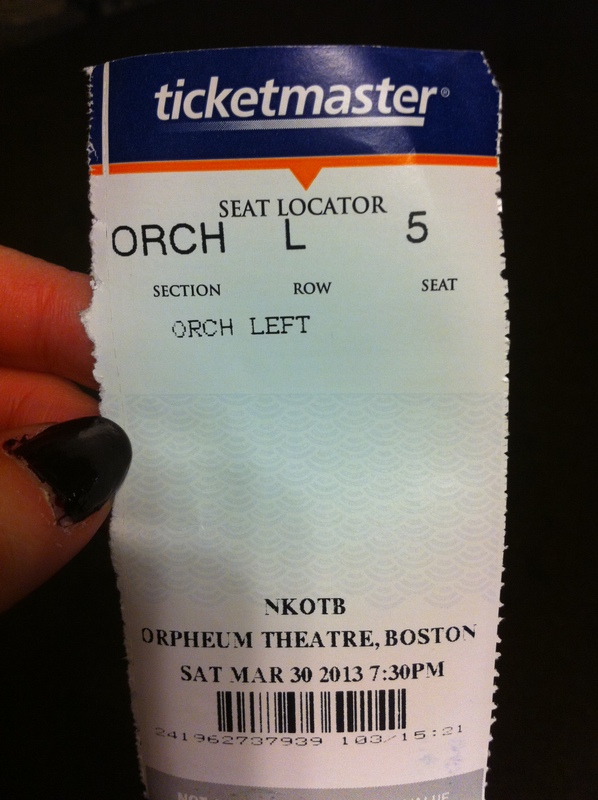 That NKOTB show was absolutely amazing! It was so great! Although they didn’t perform my favorite Single, they did perform my favorite Step By Step. It was a great show of New Kids’ oldies – very different from the shows I saw in Vegas on the Casino Tour two years ago. The NKOTB set list for Friday August 17th was as follows: One Song, Summertime, Dirty Dancing, The Right Stuff, Didn’t I Blow Your Mind, Valentine Girl, If You Go Away, Please Don’t Go Girl, Step By Step, Cover Girl, Happy Birthday, Tonight, I’ll Be Loving You Forever, Hangin Tough. Jordan right in front of me! The next day we returned to Hershey Park around noon on Saturday for Day Two of the MixTape Festival. We decided to wait at the entrance where the bands arrive. We saw Jordan walk up the stairs to the stage. Then we watched NKOTB and BSB rehearse. Luckily the stage was high enough that we could see them when they were out on the platform extension of the stage. They rehearsed Single, so I was very happy. After their rehearsal, Danny ran by and waved to us, but he didn’t stop. A few of the guys from Back Street Boys came out and shouted to us. 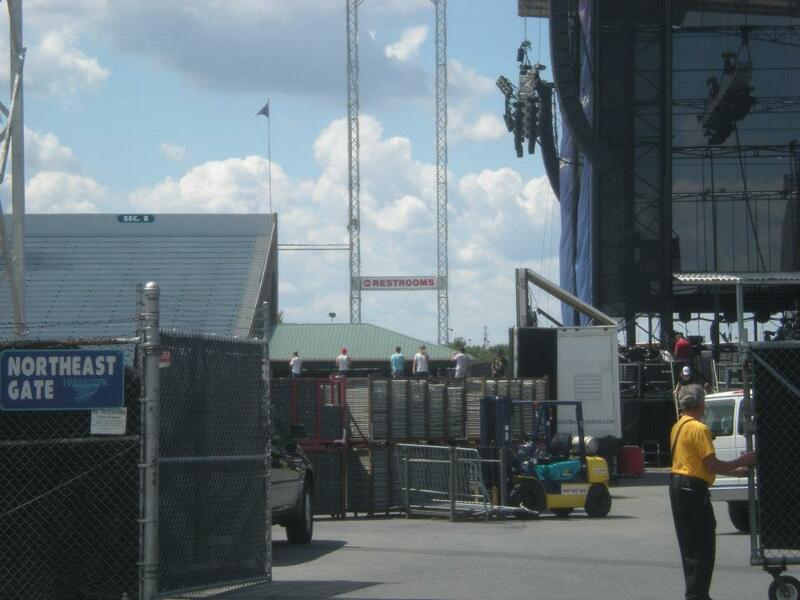 Around 4:00, we went inside the stadium, bought a tee shirt, and sat in the shade at the soundboard. Nothing could top the previous night, so we didn’t even try to be up front. Also, the platform extension of the stage wasn’t as close to the GA section as were the previous nights ‘blocks.’ We watched the Dan Band, the Wanted and LL Cool J before NKOTBSB took the stage at 9pm. They opened with Single! Now I’ve seen three different versions of Single. 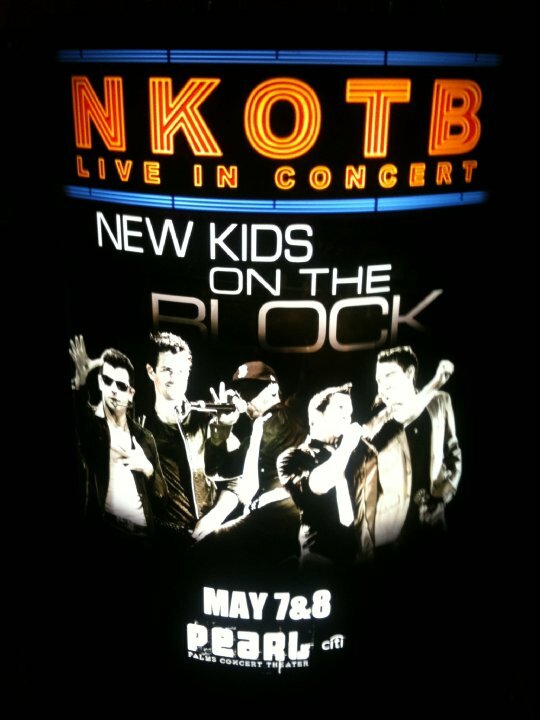 I saw the regular album version in Memphis in 2009, the acoustic version in Vegas in 2010, and now the NKOTBSB version. 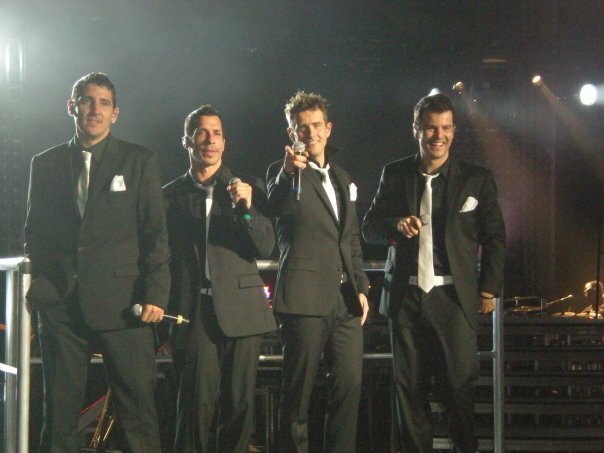 Besides Single and the songs they did with Back Street Boys, NKOTB played the same songs as the previous night. But this time they wore black instead of white. They again came out into the audience for Tonight. 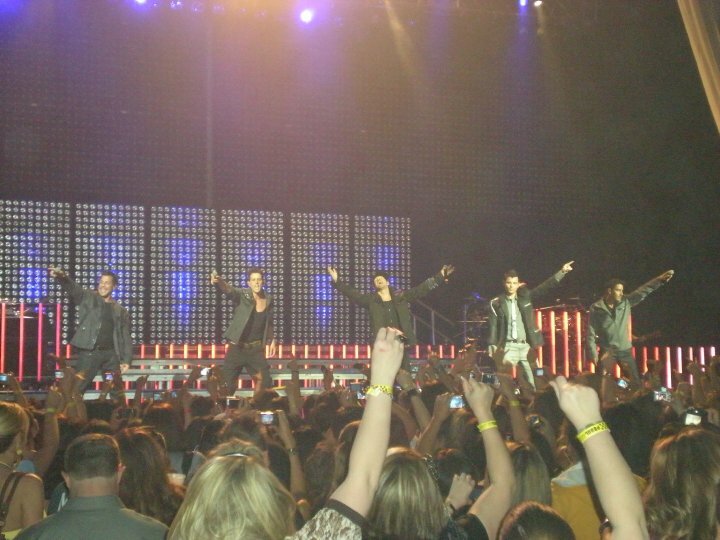 Both The Wanted and 98 Degrees joined New Kids on the Block and Back Street Boys on stage – four boy bands on one stage! It was a great show, but I’m not a Back Street Boys fan so I was kind of bored every other two songs when BSB performed. It was great to see NKOTB two nights in a row though! I listened to Single on repeat the entire 98-mile drive home Saturday night. For all 119 of my photos from the MixTape Festival, please click here. 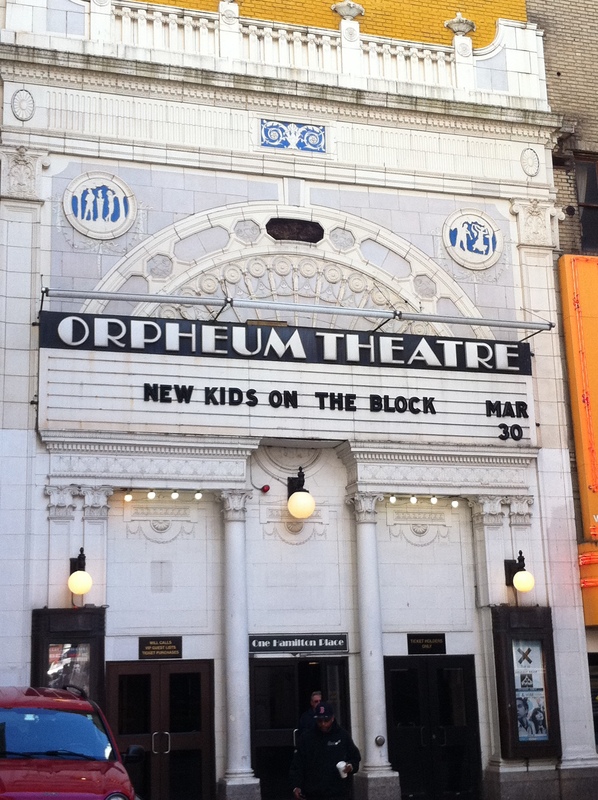 Seven months later on March 30, 2013, I saw NKOTB in a more intimate venue at their Record Release party for their new album 10 at the Orpheum Theatre in Boston. I flew up just for the night. I met my new friend Tricia at my hotel and we were at the Orpheum just after 3pm because I was hoping to catch Jordan as arrived. I did more than that! I wanted to go to the box office to see what the procedure was for our ticketless entry, so I walked up to the door of the Orpheum. I was about to go in, but saw someone standing just inside the door talking to someone else. He was leaning on the door, so I didn’t want to open it and have him fall. He started pushing his way out, so I opened the door and held it for him. I was stunned to see that it was Jon Knight. I didn’t know what to do. I looked over at Tricia and the other women waiting, but no one was looking. I didn’t want to shove my iphone in his face to take a picture, so I just said, “Hi Jon!” He said, “Hi.” I said, “Good luck tonight!” He said, “Thanks.” I was shaking – and it wasn’t even Jordan! Jon was actually on his way to get coffee, as we saw when he returned. A few minutes later Jordan come walking up the alley – the cars must have let them off at the end of alley at the street. Jordan waved and said, “Hi.” He may have looked at me and smiled A while later Joey walked up. Apparently Danny and Donnie were already inside – we just missed meeting Danny by a few minutes. Ugh! Even though all the guys were inside, we stayed and hung out in front of the Orpheum. We listened to the soundcheck – even though the fire door said not to block it and the food court security guy kept kicking us out. We heard NKOTB rehearse The ReMix, Jealous, Step By Step, Hangin Tough, The Right Stuff, Five Brothers and a Million Sisters, Crash, Whisper, and Survive You. The show was supposed to start at 7:30, but didn’t begin until about 8:15 and lasted just over an hour – although it felt longer. It opened with a montage of NKOTB’s albums while Whisper was playing – so I guess we didn’t actually hear the boys sing it during soundcheck. 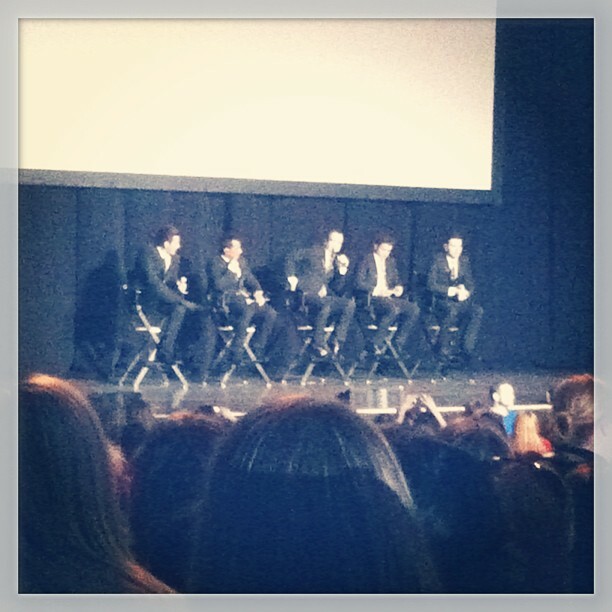 Then NKOTB appeared on stage in their suits singing what is my current favorite off ’10′ We Own Tonight. Crash was next and was followed by the guys sitting down and talking about how the new album came about. They brought Lars and the production team on stage – but there was no Q & A like Jordan had tweeted. I really wanted to ask him if they were going to play Single on this tour, and I wanted to ask Donnie where the After Party was. The sit down talk was followed by Survive You with Robbie on the piano, then a very excited performance of The Remix. And just when I thought it couldn’t get any louder, the theatre erupted with the Step By Step / Hangin Tough / Right Stuff medley. Fans then presented NKOTB with the full-page ad they bought in Billboard congratulating them on the release of 10 and thanking them. The guys were visibly moved, especially Jon who was a bit choked up to talk. Joey then sang Five Brothers and a Million Sisters while Jordan played piano. It seemed that the show was over, so I ran outside in case they tried to sneak out early. Once outside the doors, I heard Donnie talking and it was obvious they were going to sing another song. So I ran back inside the Orpheum to listen to Jordan sing I’ll Be Loving You (Forever). I would have been VERY upset had I missed that. Then I ran back outside to wait for them. It was 9:30. At 11pm, Donnie drove by us. Apparently there was a side door where everyone left – even though everyone had entered at the front door. We went to the Beantown Pub, since I hadn’t eaten in 12 hours. I wanted a Bostonian meal, so I had a lobster roll and a Sam Adams – across from Sam Adams’ grave. We found out that Jon Knight was in the back playing pool. By the time we got back there, he was upstairs talking with everyone. He was so nice and gracious. Tricia got a nice hug and kiss from Jon – so sweet. For all 88 of my pictures from the Orpheum show, please click here. Updated with the opening shows of the Package Tour at Mohegan Sun May 28-31, 2013. I had a fantastic time in Connecticut for the opening of The Package Tour at Mohegan Sun May 28, 29, and 31. I saw three great NKOTB shows, went to three great After Parties, played the slots, spent time with my mom, ate some great food, made a lot of new friends, and finally met JORDAN (as well as the rest of the guys). My favorite of the three shows was the second, even though I had more interaction with the guys at the third show. 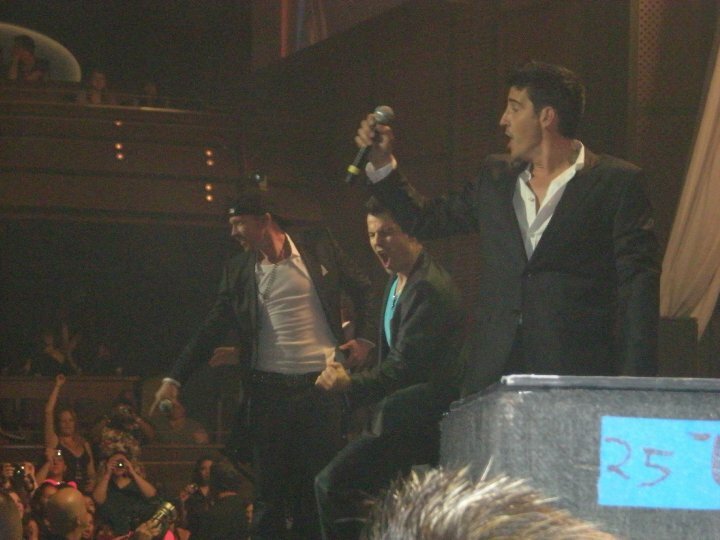 NKOTB was more relaxed on the second night, but at the same time they had a great energy. The show on the second night was a different – Crash was added at the end and there was a DJ bit in the middle. I was glad I had three completely different views of the show. The first night I sat in the stands about ten rows up off the side of the main stage. I had a great overview of both stages. The second night I sat 7th row on the floor directly in front of the main stage, but I was able to move up for the last three songs. The third night I stood on the opposite side of the main stage right at the steps, so I got a lot of interaction with the guys as they went back and forth between the stages. Mom and I left Maryland at 9am Tuesday morning May 28th to make our six hour drive in the rain up to Connecticut. Our plan was to take the Tappan Zee Bridge into New York, so we wouldn’t have to drive through New York City – plus everyone said it was quicker. We never found it, so we ended up driving over the George Washington Bridge and through the Bronx, but luckily there wasn’t much traffic. After stopping only once for lunch, we arrived at Mohegan Sun at 3:30. We had an early dinner at Virgil’s BBQ, which I thought was funny that we were in the North eating Southern food. But the bbq beef brisket and macaroni and cheese with sweet tea was delightful! I was at the arena by 6:15 to get in line for opening night. I got my wrist band for the After Party and quickly I realized I was way overdressed for the concert because I had dressed according to the dress code for Ultra 88, where the After Party would take place. By 6:40, I was in my seat in the stands on the side of the main stage about ten rows up with a great view of both stages – there is a main stage in the center of the arena and another stage at the end of the arena. Mohegan Sun Arena is so small that even my seat in the stands was close. The show was supposed to start at 7:30, but Boyz II Men didn’t come on until 7:45. And much to my surprise they only played for a half hour. They were immediately followed by 98 Degrees – there was no break in between. Much to my surprise again, 98 Degrees played for 45 minutes – they were finished at 9:00. The audience seemed much more excited for Boyz II Men, who were wonderful, then 98 Degrees. I think 98 Degrees should have opened, and Boyz II Men should have played longer. 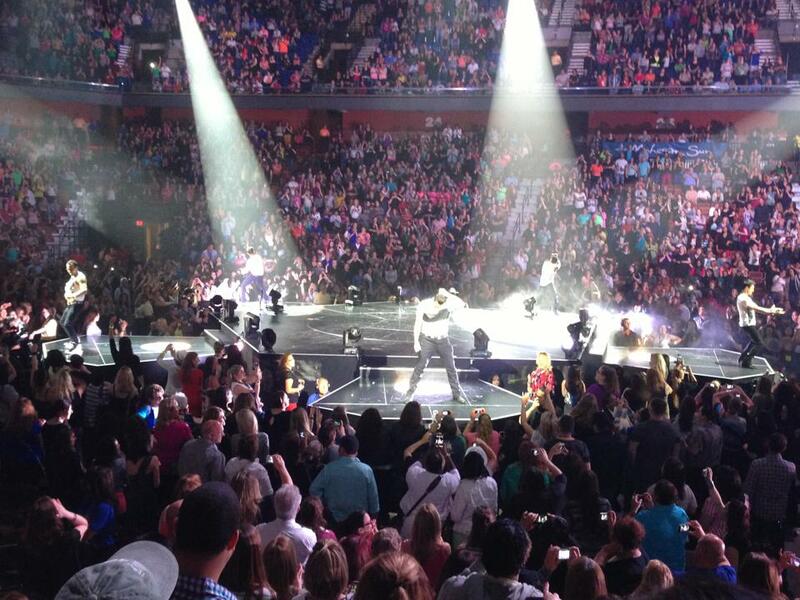 NKOTB took the stage at 9:23 to open the Package Tour on May 28th and they played almost two hours until 11:11. It was a great show with lots of excitement, energy, rising stages, and great lighting. Although I did detect some nerves and maybe too much excitement from our guys. Donnie got a little confused with the dance moves during Step By Step. It was great to see Jon and Danny sing on Survive You – and Jon sing on We Own Tonight. I was surprised they only played five songs off the new album 10. I liked how they mixed the old songs with the new, along with some covers. The set list for NKOTB from the opening night of the Package Tour 5.28.13 was as follows: We Own Tonight, Block Party, Summertime, The Right Stuff, The Whisper, Survive You, Didn’t I Blow Your Mind, Valentine Girl, If You Go Away, Please Don’t Go Girl, Remix (I Like The), Single (acoustic), acoustic snipets of: Baby I Believe In You, Just the Way You Are (Joey covers Bruno Mars), Stay The Same, Tender Love, Click Click Click, Faith (Joey covers George Michael), Kiss (Jordan covers Prince), Hot In Here (Danny covers Nelly), Dirty Dancing; Step By Step (dancing to Salt-N-Pepa Push It at end then Jordan solo dance), Cover Girl (Donnie disrobes), Games (Danny break dances), Tonight (Jordan in my section! 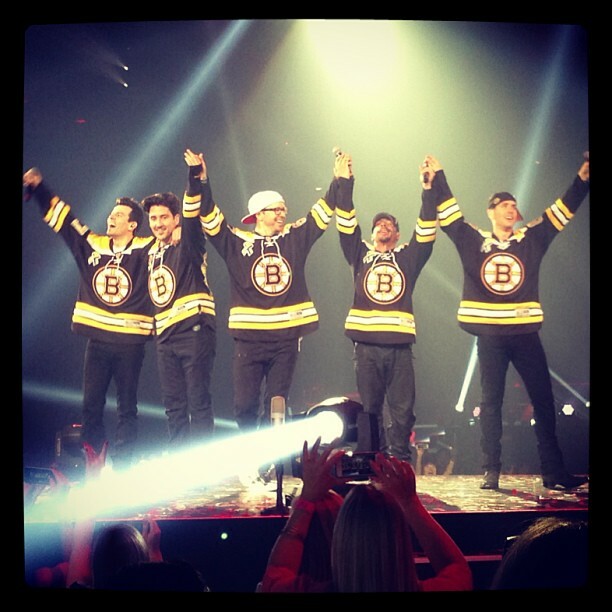 ), I’ll Be Loving You (Forever), and Hangin’ Tough dedicated to Boston – complete with Bruins jerseys. Immediately follow the show, I went to the After Party at Ultra 88 – just up the stairs from the arena in Mohegan Sun Casino. I was there by 11:30 and it wasn’t crowded at all. It cost me $50 to get in and another $14 for a glass of wine and a bottle of water – crazy! Boyz II Men arrived just before 12:30 and Danny and Donnie arrived just after 12:30. Unfortunately, the club closed at 1am – I don’t think Donnie realized this when he planned the party. But Donnie, as well as Shawn and Nathan from Boyz II Men, got on the dance floor to dance and take pictures with everyone. I didn’t officially dance or get my pictures taken with them, but I was pressed up against Shawn while Donnie was one person away from me before a wave of people shoved him in a different direction. I didn’t sleep at all that night – too busy posting videos and pictures and just overall excited from the night! After a couple of hours of resting in bed, Mom and I went to breakfast at 8:15am. I had the yummiest, spiciest breakfast at the Hash House A Go Go. It was a mixture of potatoes, spicy sausage, cheese, jalapenos, tomatoes with a side of two eggs and a biscuit – so good! We played the slots for a couple of hours, then I took a little nap in the room. At 1:30 we had lunch at Margaritaville with a beautiful view of the lake. I had a yummy Sweet TeaRita with my bacon cheesburger. Apparently I’m a big meat eater when I’m on vacation. We played the slots for about an hour after lunch, and then went back up to the room to rest some more before going to the show. I was in my seat just after 7:00. I spotted Rocco, who is U2’s stage manager. I got up to talk with him. I introduced myself and reminded him that I was one at every show with the ‘Larry Mullen Band’ shirt. I couldn’t believe he was on the Package Tour. He said he works for anyone who pays him. He asked if I had heard the rumor that U2 will be touring next year. He said he doubts it and won’t believe it until their new album is released. Rocco told me about how he started with U2. He said the he saw them open for the J Geils Band back in 1980, and U2 told him some day he would be working for them. He doubted it, since they were terrible then. Ten years later, Paul McGuinness called him and asked him to work for them and Rocco has been with U2 ever since. He told me to look out for 21 Pilots, a two piece band. Rocco said they are going to be the next big thing, and he hasn’t had a feeling like that about a band since U2. For the second night of the Package Tour on May 29th, I was on the floor in the 7th row off the front of the main stage. Boyz II Men took the stage at 7:45 and again only played for a half hour – until 8:17. At 8:20, this time a three minute break in between, 98 Degrees came on and played for 45 minutes until 9:06. Someone spilled a drink on me about halfway through 98 Degrees’ set, so I went back to the concessions and stayed until they were over. I’m not a huge fan of 98 Degrees, although that Nick Lachey is very cute. NKOTB took the stage at 9:23 with an energy that was greater than opening night, and the guys seemed much more relaxed. Danny was in our section for Tonight. 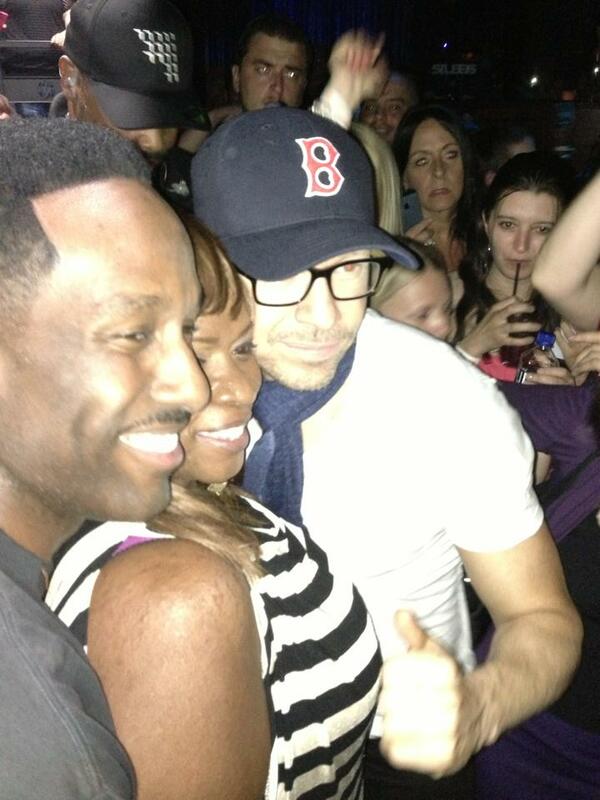 Donnie took the video camera after Cover Girl and was filming everyone. I moved up front for the last three songs. It was the same set list as opening night except there was a DJ section in the middle where the guys just danced while the DJ played songs and the show ended with Crash, after Hanging Tough. The show ended at 11:15. 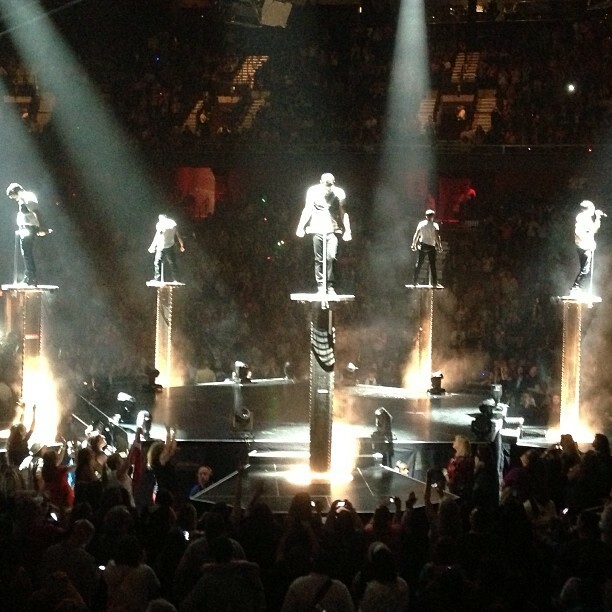 This was my favorite of all three shows at Mohegan Sun. Immediately after the show, I went to the Boyz II Men After Party at Vista Lounge – in the rocks at Mohegan Sun Casino. This was a beautiful club – very open. This After Party was free. 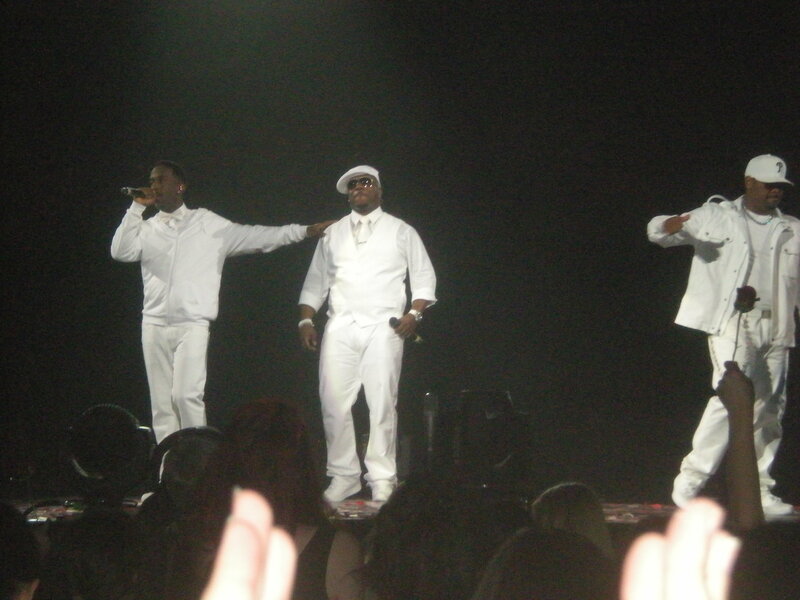 All three guys from Boyz II Men were there and arrived on time at 11:30 – no Donnie or anyone from NKOTB though. Wanye sat down next to me at the bar, so I couldn’t resist asking him why Boyz II Men weren’t playing longer. He just smiled, shook his head and said it wasn’t his tour. I told him 98 Degrees should be opening, not Boyz II Men, because the audience is way more excited for Boyz II Men. He again smiled, shook his head, and said it wasn’t his tour. He got up shortly after that. I didn’t sleep that night either – maybe an hour or two. We checked out of Mohegan Sun Thursday morning and checked into Foxwoods Casino about 7 miles away. Friday night at Mohegan Sun would have cost us $550., so we decided to split our time between the two casinos spending two nights at each. I like Mohegan Sun much better than Foxwoods. Mohegan Sun is a great resort with nice restaurants and clubs. Foxwoods is older with no clubs, ok restaurants, but great slots. We stayed at the Pequot Tower at Foxwoods. We had lunch at the Festival Buffet and then hit the slots for a few hours. We took a break in the room for a bit then had dinner and drinks at the High Rollers Lounge, which was great! A great lounge with comfy chairs and low tables, a 103″ television, and 10 bowling lanes on both sides. The food was great! We had a yummy lobster cheese dip with hot pita chips and a great pepperoni and an extra cheese pizza. To wash it down, I had two white sangrias. We played the slots a little more and was in our room just after 8pm. I was SO tired. I only had a total of three hours sleep since I left Maryland Tuesday morning. After a more restful night of sleep, I got up at 8:30am to watch NKOTB on the Today show. We played the slots before and after lunch, but our luck did not change. I had a yummy bacon cheeseburger for lunch at the Veranda Cafe before grabbing a cab over to Mohegan Sun. I was at the VIP check in table by 4:00. 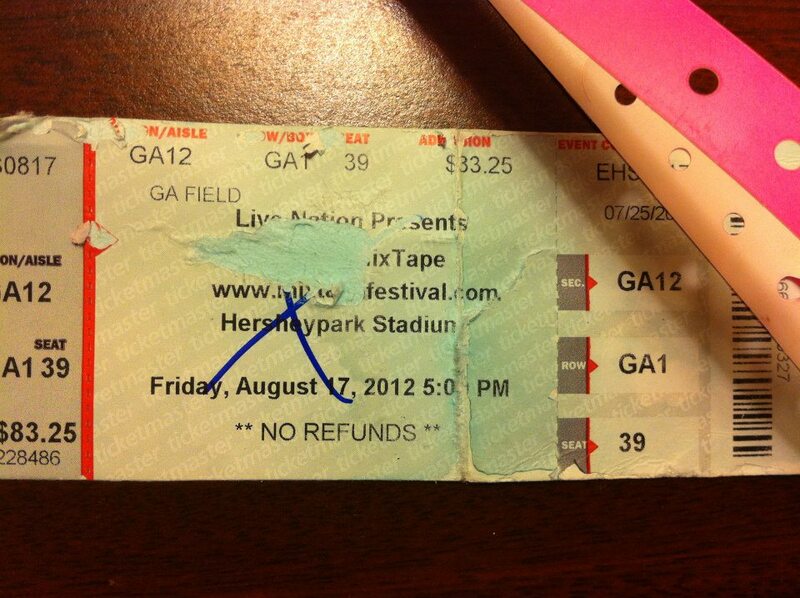 This was my first ever five star NKOTB VIP. I met Laura and her friends, as our group of 10 to meet the guys. Around 4:30 or so they took all the groups up to Ultra 88 for a little pre-show party where we had complimentary drinks and appetizers. Although I was too nervous to eat, I did have a drink. I inhaled my sangria, so thought it best to stop after one. I didn’t want to embarrass myself with Jordan. Meeting NKOTB was very quick with no time to talk. The guys were lined up from right to left: Danny, Jon, Joe, Jordan, and Donnie. The ten of us ladies walked in a single file line and hugged each one as we walked by. Danny was very happy and smiley. Jon and Joe seemed tired and a little out of it. I got to Jordan and introduced myself. Jordan said, “Hi Deena” then hugged me. I stopped there to pose for our two pictures with all ten ladies and our five guys. Jordan and I stood with our arms around each other for the first picture while Laura stood away. Then for the second picture I stood away and Laura stood close to Jordan. This way it would be easier for us to crop ourselves out of the group picture, so it looks like it is just the two of us. After the photo, I turned to hug Donnie and thought he was going to kiss my cheek , but it was just a hug. Then we were out of the room. I think the whole thing took a minute. I went into the arena when the doors opened at 6:30. For this third show of the Package Tour on May 31st, I was on the opposite side of the main stage from where I was the previous show about four rows back. I decided to move up and stand at the rail right at the steps to the main stage – within arms’ reach of everyone who walked onto the stage. Good decision on my part because I got to see all the guys up close as they went back and forth between the two stages. I think I touched everyone’s hand from Boyz II Men, 98 Degrees, and NKOTB. I distinctly remember holding hands with Nick Lachey, Jordan, Donnie, and Danny. At the beginning of Tonight, all the guys left the stage by the steps by me, so I got too see all of them up close. I got to hold Jordan’s hand for a bit. At the end of Please Don’t Go Girl while Joe is doing his thing on stage, the other four guys stand frozen on the steps and Jordan was closest to me – just standing there for what seemed like several minutes. Sigh! And during Step By Step, Jordan sang most of the song on the steps in front of me. This time for Hangin Tough, the guys wore Red Sox jerseys. The set list was the same as opening night. I didn’t take any videos and only a few pictures at this show, even though I was closer, I just wanted to completely take it all in and enjoy the moment. 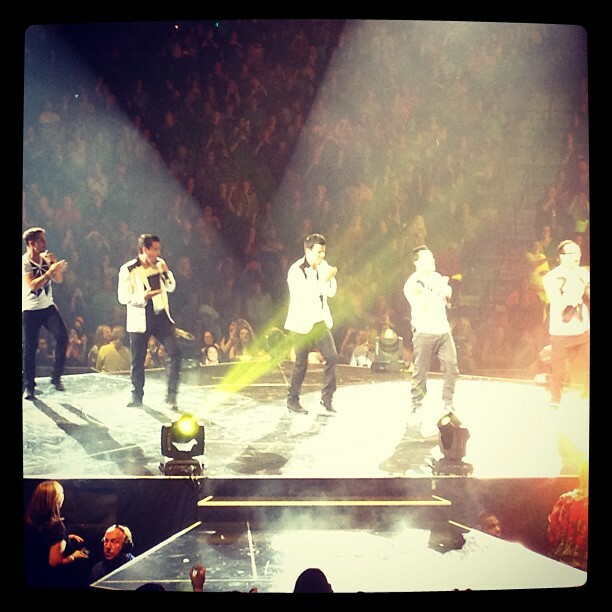 Although I was much closer and had lots of interaction with NKOTB, the show the second night was my favorite. Immediately after the show, I went upstairs to Ultra 88 for the After Party. It was SO much more crowded than opening night. There was a huge line to get in and it was already crowded inside. I stood right where I knew the guys would be hanging out – a little raised room. Two of the guys from 98 Degrees showed up arrived at 11:40 – the two who aren’t Drew or Nick Lachey. Boyz II Men arrived just before midnight and Donnie and Danny arrived just after midnight. Although the After Party would go on until 2am, I left early and was back at Foxwoods by 1:30am. I had the most sound sleep that night. We left Foxwoods just after 10am Saturday and were home by 5pm. We finally found the Tappan Zee Bridge! I am always sad when I trip like this is over, but I couldn’t have asked for a better time. Plus I get to see NKOTB two more times this summer – in DC a week from now and at MixTape Festival in Hershey at the end of July. So check back and follow me on twitter @DeenasDays as I continue on The Package Tour. If you would like to see all of my pictures from the shows at Mohegan Sun, please click here for opening night, here for May 29th (my favorite show), and here for May 31st. I am soooooooooooooo jealous!! I’ve never seen them live *cries*. I was in love with them when I was little (especially Joey – me and my friends used to argue about who he would marry). There’s a group from England, called East 17. I never got to see them live when I was young because they only played big areans, and I was too young to go there. Then a few years ago they did a comeback, and I got to see them. It was the best gig I’ve ever been to. I felt like I was a child again. Thanks! glad you liked it. 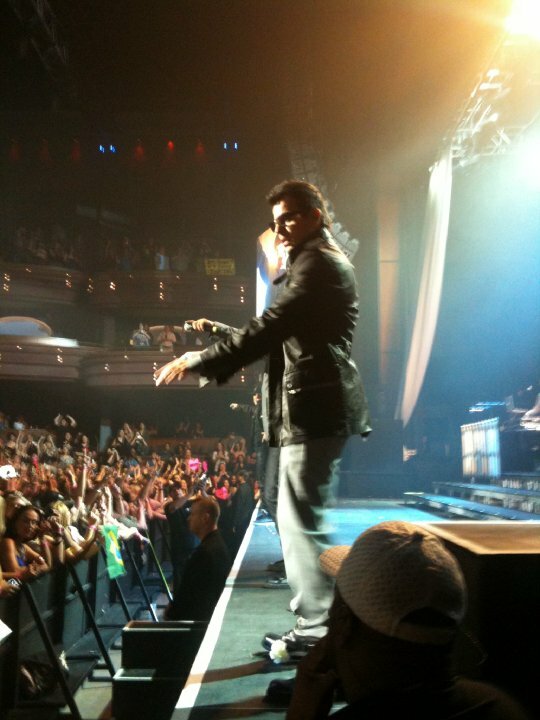 maybe NKOTB will tour england after they tour here and you’ll get to go.